Many of our clients that come in for their initial free consultation aren't sure which type of bankruptcy is best for them and many aren't clear on the differences between the most common chapters – seven and thirteen. Our first job is to educate you on both of the plans and then look at your unique financial situation and explain what each plan offers to you and the benefits and downsides to each. From there, we make a recommendation but, ultimately, it's your decision because it's your financial future. 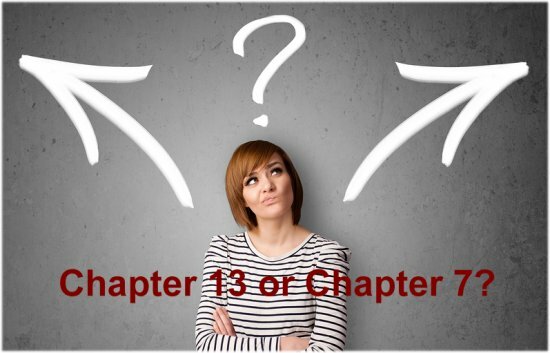 For our clients that choose Chapter 13, there are two primary reasons we recommend this plan over Chapter 7. First, there are those clients that cannot pass the Means Test that would allow them to file a Chapter 7. Ever since the bankruptcy code was amended in 2005, it has become more difficult to file Chapter 7. Those that have higher incomes will not pass the first phase of the Means Test, but they may pass the second part if they have minimal disposable income. For those that have expenses above and beyond those “allowable” for calculation of disposable income, it may appear that they have more disposable income to pay bills than they actually do. But the Means Test is a hurdle that is mandated by law. Those of our clients that cannot pass it but still need debt relief are often well served by filing a Chapter 13. This allows them time to get caught up on payments and typically see some of their unsecured debts discharged at the end of their repayment plan. The second type of client that ends up with Chapter 13 is one that has secured debts they are behind on and want the opportunity to catch up on to preserve the asset. If you are behind on your car loan or mortgage and are being threatened with repossession of your vehicle or foreclosure on your home and you want to prevent it, Chapter 13 can help, depending on your other circumstances. With a mortgage, the payments you have missed plus any late fees or additional interest can be paid off over the length of your repayment plan – anywhere from three to five years. You may also be able to work with your lender to refinance your loan so that your current payments are more affordable. Filing a Chapter 13 also has the added benefit of shutting down any foreclosure action which can give you more time to negotiate with your lender to get the best deal possible to keep your home. When it comes to a vehicle loan that's delinquent, you'll still have to catch up the arrears, but this can be done through your payment plan over time rather than as a lump sum. And what's even better is that if you owe more than your car or truck is worth, your attorney can request that your loan amount be reduced to the fair market value of your vehicle. They can also push to get your interest rate lowered. This can leave you with time to pay off the back balance and much lower future payments, which can make a huge difference in your budget and ability to pay your bills. Contact the law offices of John T Orcutt for a free consultation to discuss your financial difficulties and to find out how bankruptcy can help. We have several convenient North Carolina locations for you to choose from.